Welcome back Seawolves! Coming back to school after a long break can be a serious struggle if you aren’t prepared. Luckily, Seawolf Living has your back, we have prepared a guide to help you mentally and physically prepare for the new semester and make it your best one yet! If you haven’t already, make sure you have a planner or notebook to keep track of everything you need to get done. It can be stressful coming back from vacation and feeling like you are already drowning in deadlines and responsibilities. Having a planner will help you organize all your responsibilities from what books to buy to important deadlines around the corner. This way even if your brain isn’t all there yet, your planner will have your back. If you’re in need of a planner, our University Store has a great selection. This is 100% one of the hardest things to get in the habit of doing after break. It happens to the best of us, forgetting to check canvas, email or Moodle for a day or two within the first few weeks of the semester and missing important deadlines or quizzes that impact your grade in the course. Don’t learn this lesson the hard way, set a reminder on your phone or write it down in your planner… or do both to be safe. It’s not fun missing an online quiz at the beginning of the semester and then having to play catch up to make up easy points. Coming to class prepared with the syllabus ready and aware of upcoming assignments and quizzes is the best way to not get behind in your classes. 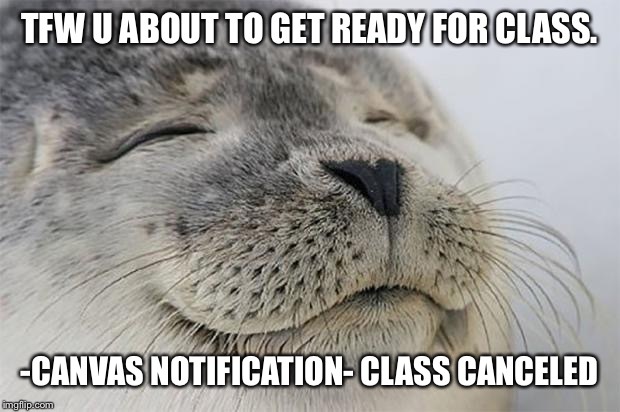 Plus, there is always the incentive to check if class was cancelled that day. If you have been staying up until 3 AM every night and sleeping in until 12, and in less than a week you have your 8 AM bio lab twice a week, it might be worth it to start adjusting your sleep schedule. While this is easier said than done, your body will thank you. Some tricks to do this are to cut back on caffeine during the day, start waking up earlier and find things to tire you during the day so it will be easier to fall asleep at night. The same goes for those who go to sleep early but have a night class until 10 PM coming up soon. Start staying up later so you are more adjusted to your class schedule. Also, huge believer in the power nap. If you have thirty minutes and are exhausted, take a quick nap to recharge before you continue with the rest of your day. This ties in with planning but is super important to remember. Make sure you have a notebook or two for the first day back to class along with a pen and pencil. Bring some snacks for those long lectures. Even if you think you won’t need it, it is better to be safe then sorry. Professors take mental note of who is prepared the first few weeks of class and who isn’t, make sure to make a good first impression by being awake, prepared and ready to take on the semester. With these steps in mind, you are ready for a great semester! Remember planning and preparation is key and will help you more than you know with your success this semester….. and don’t forget snacks and naps are your friend.